Note: Except for Form 1098, tax documents starting from 2016 to the present are now accessible in Workday. Please check your email or consult your supervisor for more information. To view your 1098, please view the instructions below. 2. Select Student Resources at the top of the page. 3. 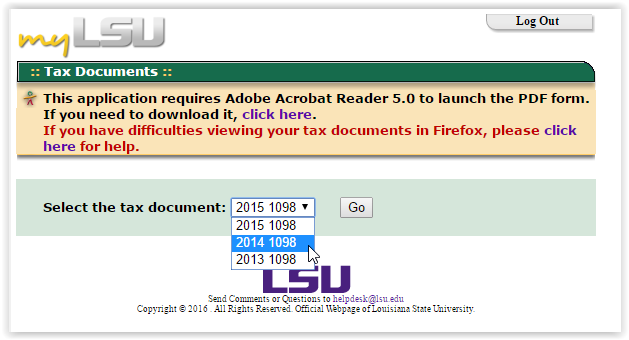 Under Student Financials, select My Tax Forms (Prior to July 2016). 4. Use the Drop down menu to choose which document you want to look at. Click GO. 5. The Tax document will be displayed.